Many years ago, I had a couple of Roman Catholic ladies come to my door. They went on to explain to me that the problem with the world today was that too many people read the Bible (I in no way am suggesting that this is typical of Catholicism). After my initial shock, I realized there was a very small kernel of truth in their statement. The problem is not that too many people read the Bible but rather too many people read the Bible incorrectly. I believe that one of the most important roles for the Church today is to teach people how to read the Bible. 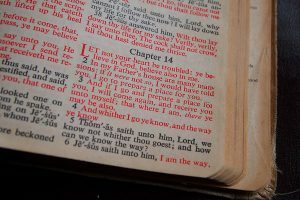 My intention in this post is to help people understand some basic principles for reading the Bible. The interpretation of the verse must coincide with the intention of the author. Always start with what the author intended to say. The Bible was written for us but not to us. Determine who the original audience was. A promise to the people of Israel or the twelve apostles is not necessarily a promise to us. Verses have a context. Many see verses of the Bible as free floating bits of Scripture. Always read the verse in the context of what surrounds it. Read obscure verses in the light of clear verses. There are some verses that are difficult to understand (e.g. baptism for the dead). Focus on what is clear in Scripture. Pay attention to genre. Do not interpret the Psalms (which are poetry) the same was as Samuel/Kings (which are history). Although the Bible is inspired, God used the personalities, language, style and circumstances of the writers. The Christian canon has two testaments. Do not ignore the Old Testament as if it is now irrelevant. The Old Testament was the Bible of Jesus and the apostles and we should take it seriously. Consider these seven principles as you read the Bible. We want more people reading the Bible, but we also want more people reading it well. Recommend Resource: Genesis to Revelation: A Taste of the Entire Bible.